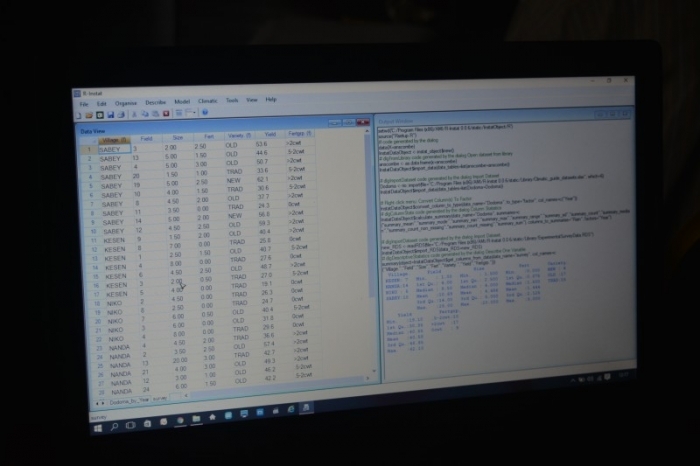 Instructions on downloading and testing R-Instat can be found here http://www.africanmathsinitiative.net/blog/initiatives/african-data-initiative/. Thanks again for all your contributions and continued support on our journey to improve statistics for everyone. A lot has been happening with the African Data Initiative since we released the first beta version of R-Instat. Our first full version is coming soon and beta versions are already being used to improve statistics teaching and research in Africa, and beyond! We're officially launching R-Instat at the World Statistics Congress in Morocco in July after our proposal for a special topic session on the African Data Initiative project was accepted, which we hope can kick start the next phase of ADI. As always, none of this would have been possible without all of our fantastic supporters so we want to once again thank you for all your contributions and continued support on our journey to improve statistics for everyone. James Musyoka (star of our campaign video) is using R-Instat this semester at Maseno University, Kenya to teach an innovative statistics course to his undergraduate students. Not only is he making use of R-Instat to give his students practical experience using data, but he's also using e-learning resources, developed by one of our partners, and now adapted for R-Instat, to provide his students access to high quality digital notes, examples and exercise. We look forward to sharing the feedback from James and his students with you at the end of the course. More groups benefiting from R-Instat! The creator of the corruption risks measurements, Mihaly Fazekas, is using R-Instat in his teaching on an international Masters program in Public Procurement Management at the University of Tor Vergata, Rome, Italy. We're really pleased about this because it shows we are already fulfilling our ambitious of spreading R-Instat outside of Africa! We're thrilled to announce that we will be launching R-Instat and the African Data Initiative at the World Statistics Congress in Morocco in July. This will be an excellent opportunity to showcase our ideas and set out our plans going forward to change the way people learn statistics. The international event will attract prominent statisticians from all over the world and we're excited about the exposure and opportunities this could generate for our project. At the satellite education conference just before ISI, IASE: Teaching Statistics in a Data Rich World, our team, including developers from Kenya, will present a series of statistics education papers discussing the role R-Instat could play in improving teaching. We're looking forward to feedback we get and the opportunity to discuss with other educators from around the world about ways in which stats education is being progressed. 8 November 2016 – Beta release available! Today is a special day. It is exactly 1 year one since our successful crowd funding campaign came to an end and the work on R-Instat began. To celebrate this, today we are proud to be releasing the first beta version of R-Instat. There is still some way to go before the software is ready for a full release, but our team has made huge progress and we’re excited to share this with you now. Below is a link to the AMI website, where you can download R-Instat and some supporting documents. Thank you once again for your support and for joining us on our journey to improve statistics for everyone. 15 September 2016 - R-Instat used for the first time in Tanzania! This is our first update to our crowd funding campaign for almost a year, so first we apologise to all our wonderful supporters for keeping quiet this long! However, we hope you'll quickly forgive us when we tell you about all the exciting progress we've made over this last year. We're now very close to releasing a beta version of our new open source statistics software, which we're naming R-Instat, that can be shared with you and others who are interested in the testing it out at this early stage. This month, as well as testing the software in preparation for the beta release, R-Instat was used for the very first time to teach statistics! 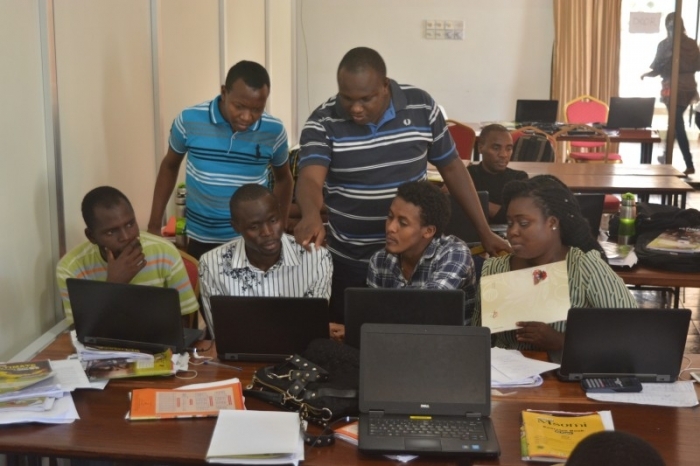 The 'guinea pigs' were 54 Mathematical Science Masters students studying at AIMS Tanzania. The students were all extremely talented, having obtained scholarships to attend the program and they come from diverse backgrounds across 16 African countries. 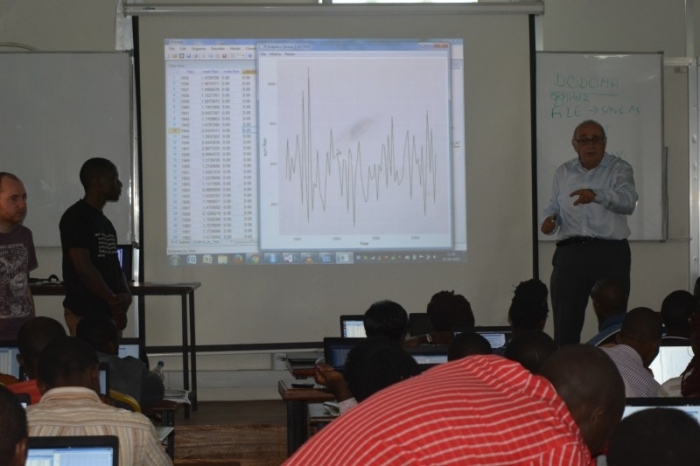 The course was taught by Roger Stern (Reading University, UK) and James Musyoka (Maseno University, Kenya) and the course title was Dealing with data. This was the students' first of 6 statistics course on their 1 year MSc Mathematical Sciences course. During the course, students learnt how to organize data, as well as visualise data through graphs and produce simple summaries. It was exciting that much of this was done using R-Instat, along with spreadsheets, and our promise of producing software that's simple to use meant students could concentrate on learning key concepts in statistics without being distracted by complex software. Students were also introduced to other free resources such as the CAST e-textbooks and the eSMS (Statistics Made Simple) online statistics course. We expect to be releasing successive beta versions of the software over the coming months as we continue to add core features and carry out testing. Thank you again for your support and for joining us on our journey to improve statistics for everyone. Congratulations to the four winners and thanks again to everybody who took part! 20 October is World Statistics Day, and to celebrate, the Statistical Services Centre is running a prize draw, open to anyone who donates to this project between 10 and 19 October. Any donors who complete their donation and the accompanying webform to get onto the map (see below!) during this time will be entered into a prize draw to win a place on their e-SMS - Statistics Made Simple online training programme. To enter the draw, all you need to do is donate £1 or more to this campaign between now and 23:59 GMT on 19 October. For every 20 entries, the SSC will offer 1 free place on the course, chosen at random. For more details about the promotion, please see the Statistical Services Centre website. The campaign now accepts bitcoins! Click on the supporters map below or go to www.supportingami.org/africandatainitiative/suppor... for further details. 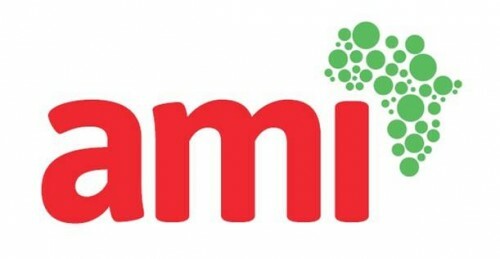 SAMI also has a Euro and a US$ account if you prefer to contribute directly to them and avoid currency exchange charges. Contact SAMI (www.supportingami.org ) for further details. 11 September 2015 - Meet the team! This is our first major update! Thank you all for your contributions and support so far. We're very excited to announce that, because of your support, we now have a core team in place to create the software! Meet John, Mary, Maxwell, Polycarp and Steve, as they introduce themselves. They are all Kenyans who have been involved with AMI, hence we are very confident of delivering the first version of the software in time and at the quality that is needed. More updates will be coming soon. If we can get the funds, we hope to expand this team beyond Kenya, Please keep supporting and sharing the campaign, and thank you for joining us on this journey. There is a problem with statistical literacy throughout the world and we are keen to address it in Africa. This skill is invaluable in enabling informed decision making which is so vital in creating a stable and sustainable society. This requires a combination of better training and suitable statistical software. We've identified a gap in the statistical software available. We need software that is easy to use, even with low computer literacy. It should encourage good statistical practices and learning. It should also be free and open source, so that it is adaptable and sustainable. Without the software the training is usually too theoretical. The appropriate software opens the door to training that can emphasize concepts rather than theory. Producing a statistical software tool by adapting two existing packages: Instat+ and R.
Train lecturers in educational institutions to adopt a more practical approach to statistics training. Make the training resources and software available in multiple languages. Change statistics training across all academic levels, not just universities. In particular we want to enhance teaching of statistical basics in schools. Who has contributed? See our map! Click on the map to see where the contributors are coming from and what they have said. If you did not put your location on the map when you contributed you can add it now. Just click here and add your details. We are a consortium of partners with a wide variety of experiences, working in Africa and internationally, and having expertise in statistics, mathematics and research. We're confident we can deliver everything we are promising with this project. 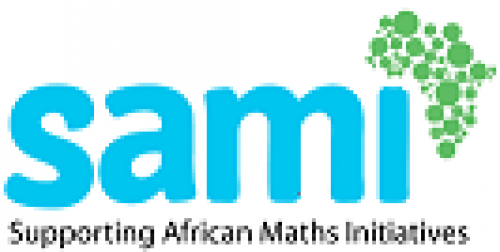 The lead is taken by AMI, (African Maths Initiative), a Kenyan NGO in Western Kenya which has grown from initiatives taken by staff and students of Maseno University. For transparency and accountability, the finances are managed by SAMI, (Supporting African Mathematics Initiatives), a registered UK charity which was started by volunteer teachers supporting Maths Camps in Africa. The SSC (Statistical Services Centre), a not for profit consultancy unit within the University of Reading, will provide and coordinate the expert support to the project. With over 30 years of experience in offering statistical support to projects all over the world, the SSC understands both current international standards and the local situation for our African counterparts. The International Association of Statistical Education (IASE) will provide a network of experts and mentors for the team. The African Institute for Mathematical Sciences (AIMS) is a pan-African network of centres of excellence for postgraduate mathematical sciences. Some of their most talented graduates will form the core of the development team and AIMS-Tanzania will provide a stimulating working environment for part of the team. 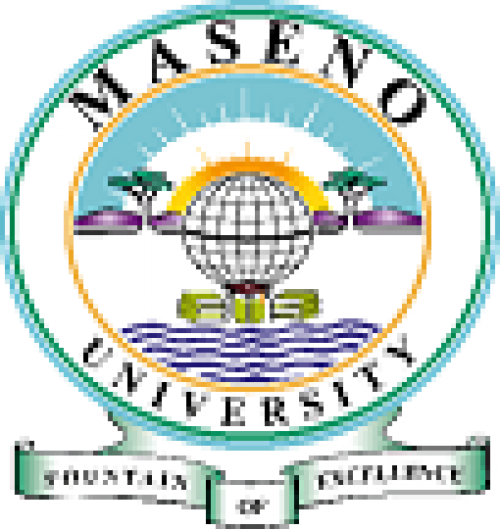 Maseno University, a public Kenyan University which offers all its degree programs with IT, is first in line to pilot the software in its teaching. Maseno will also host part of the development team. We believe strongly in an open approach, both to the software and the educational resources we develop. As such we are very happy to include other partners. If you would like to collaborate, feel free to get in touch. We thought long and hard before launching our campaign. We researched, brainstormed, discussed and argued (constructively! ), with anyone and everyone who would listen before feeling confident enough to share this project with the world. There's now no doubt in our minds of the importance of what we want to do. But I know of so many statistics software packages out there already. How can there possibly be 'a gap'? 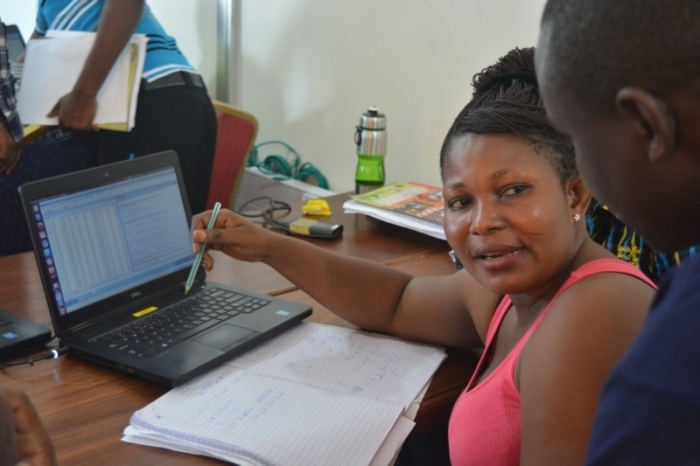 Many researchers in Africa do have grants that could pay for licences for software, but their institutions do not have a well-defined software policy. The yearly licensing model for most statistical packages makes staff uncomfortable, as the licence would cease when their grants stop and the existing licence could limit their capability of involving students and others in their work. They need an option that's free. The obvious answer is therefore R but very few researchers are comfortable enough to write R commands. We have trialled R front ends that already exist, but researchers found them all rather intimidating. Nothing felt designed for their needs, something which is so easy to use they can focus on good statistical practices rather than learning about R. Hence this project. I'm interested in supporting African development. Surely there are more important things than Statistics!? Making it easy to turn data into information can impact many fields of application. The need to process data is something that health, agriculture, education, politics, climatology, security and development all have in common. Assisting individuals, organisations and even nations to make more sense of the growing amount of data they have available so they can make better decisions could have more overall impact in the country than an advance in any one of these fields. So while it is certainly true that there are more important things than statistics, improving statistics is a small change with the potential for big impact. Serious programming projects are expensive. What do you hope to achieve with £33,000? We would be using the money for a team of at least three bright young Mathematical Scientists (Maths, Stats, Computer Science and Physics) who want to make a name for themselves and further their own education. We're aiming particularly at people between a Masters and a PhD who will get mentoring and support through this project that will help them take the next steps. It is likely that they will be primarily AIMS Graduates and we have already identified potential candidates. AMI has a long term partnership with the Statistical Services Centre, University of Reading who are committed to supporting this venture. They play a critical role and are involved in conceptualising the work as well as mentoring the team. They are offering substantial contributions of their time as well as many of the perks to enable success. This collaboration is central to our project; it ensures we are well informed and building from a solid foundation. We are also leveraging other collaborations with partners such as UKMET, CCAFS and WMO to continue to include a strong capability for the climatic analysis of historical data. Through a recent project we have found that it is now easy to access R through a .net front-end. Although not perfect this access provides the missing link. We are therefore confident that the task is achievable within a year by the proposed team with considerable mentorship and guidance. The open source licence means that if our initial product proves its importance then sustainability and long term development can be ensured through an international community. Our choice of developers is such that they could play an important role in the long term. Finally we are comfortable with this formula. The young and bright scientists from Africa, who will be employed and mentored, are central to ensuring the resulting software is appropriate. Aiming to use international programmers is the norm, and would be easier to manage, but it would run the risk of developing for the environments they know rather than the African context. It would also be much more expensive. £18,000 for stipends for at least 3 developers for 1 year each. Emphasis on AIMS graduates. Have identified potential candidates. £15,000 towards interactions with experts. Looking for at least 5 interactions, potentially both experts going in and members of the team going out. For us perks are about building the community, not a gimmic to attract donations. We've thought carefully about all our perks and explain our approach in the FAQs. Scroll on the right hand side to see the perks currently available more will be added for each of our stretch goals. Be on our supporters map! - We value the community we build for this project as much as the money we raise for it. By putting yourself on our map we can get a feeling of where the community is growing. Learn some stats. It's the course that started it all for James, and we want our supporters to be able to have the same experience. We appreciate the members of our consortium who have agreed to cover the facilitation and running costs of eSMS (eLearning - Statistics Made Simple) as part of their contribution to this project. We have £33,000 as our initial target, but there's so much more we want to do. We've already thought about how extra funds can stretch us. £58,000 would mean we could also train 50 African lecturers who teach basic statistics courses through e-SMS with the 20 most engaged invited to a workshop to investigate how the eSMS OER (Open Educational Resources) could be used to improve statistics teaching in universities. Up to £4,000 for up to 40 places on eSMS at £99 per place. These places will be matched by the SSC, covering the 50 and up to 30 perk lecturers (see additional perks below) places on e-SMS. £15,000 for the lecturer workshop. £6,000 Additional development costs related to adapting the software to some specific needs related to university teaching. Possibly through an additional developer or additional expert visits, or even through an extension of time spent on the development. 30 "Nominate an lecturer". You will nominate someone for eSMS who will join the eSMS course with our cohort of lecturers. If your nominee is amongst the 20 most promising participants, he/she will get invited to the workshop. £50 each. With £100,000, as well as delivering on Stretch one we would also translate the software into at least two other languages and e-SMS in at least one other language. 2 x £13,000 for each translation of the software into a different language. The exact cost to translate either the software and documentation or the eSMS course will depend on a number of factors including the chosen languages (see additional perks), but based on a recent quotation for a similar project we are confident that we will be able to deliver on this commitment. The Big stretch! £175,000: Get it to the kids. The big dream is to impact statistics across all academic levels, not just universities. If we reach £175,000 we'll be able to carry out initial attempts at integrating with statistics literacy at school level. £25,000 Towards interactions with schools through maths clubs and mini-maths camps. £25,000 Towards a conference/workshop designed to bring together experts with the express purpose of what's there/what's possible/identifying. £25,000 Additional development costs related to adapting the software to some school specific needs as per requests coming from interactions with schools. 2 "Come with the kids". Your family, or the family of your choice, get to arrange a personal holiday of a lifetime. Have you ever wanted to have a more 'real' experience on vacation where you get to meet and be inspired while doing something worthwhile. This is your chance to be hosted by our team on the ground who will help you plan an unforgettable experience adapted to the individual needs. Meet the inspirational people that we work with and give your Kids a gift so hard to get at home: A positive perception of Africa! (Flights, insurance are not included but you will be offered local accommodation with our partners if you want.) £10,000. There are many ways you can help besides making a contribution. Help build our community, make some noise about the campaign, tell people why we're worth supporting. Send us a comment about the campaign - it may help us to improve it. Translate our transcript into your own language. Get in touch and we will send you the files for translation. Help us raise our social media presence #AfricanDataInitiative. Like AMI on Facebook who will sharing the story of the campaign as it progresses. Thank you for taking the time to read this far, we appreciate that your time is valuable and that you have therefore already contributed by taking the time to think about the campaign. We truly value every single contribution to our project, big or small. That's why we created a supporters map. This campaign is as much about building a community as it is about raising the money. 1. There are a lot of statistics packages out there. Surely there's no need to develop another one from scratch? This is correct, starting from scratch would be foolish. The key is to build from what is already there. We're combining ideas from existing packages primarily R and Instat+, with Excel as an important reference point. Within Africa, Excel is currently used extensively despite being limited in its statistical capabilities. Users end up with lots of data from which they are not extracting all the useful information that they could. It remains the dominant package primarily because it is widely available and easy to use. Instat+ is a free package which was designed as a first statistics package, encouraging good statistical practice and being easy to use for people who are not expert in statistics. It was always expected that if a user's needs progress beyond the capabilities of Instat+ they could graduate to a “grown-up" package like SAS, SPSS, GenStat, Stata, or R.
R is the statistical package of choice for us moving forward. It is open source and has a large and varied community contributing to it, which ensures it will always remain free, while continuing to be up to date and cutting edge . But it is not easy to learn without a high level of computer literacy. There are already a number of excellent frontends to R which do make it easier to use, but none are adapted to our needs. We require a frontend that is easy to use and encourages good statistical practice, in essence bridging the gap between Excel and R, just as Instat+ has done in the past. 2. In the video, James said that data suggests his generation may be the one to transform African economies. Can you expand on this point? There's a nice TED talk by Charles Robinson that is very optimistic about Africa's upcoming development. The basic point is that if you look at the data about how Africa is developing there are startling similarities with Asian statistics from the past just before they experienced radical transformative growth. The data supports the fact that no one knows what will happen in any given country because the variability is high but looking at a continental level, on average it is possible that the growth rates will be transformative over the next few decades. It's clear looking at the Asian examples that good decision making will be critical in achieving transformative development. We believe that basic statistical understanding is an essential tool for decision makers at all levels to evaluate different option and to interpret the information which is available to them. 3. James got a first degree in applied statistics. How is that possible without understanding basic statistical concepts? James got the highest possible mark in Maths at school, which led to him getting being selected for what was then a prestigious degree in Applied Statistics. As is often the case in Kenya he didn't know what statistics was and wasn't really given a choice of degree. He was very bright, able to remember what the lecturers told him and able to reproduce it faithfully in exams. This was all that was asked of him. He did exceptionally well getting a first class degree and a rare scholarship to continue with his studies, whilst being employed by the University. Like all his classmates, he thought that doing statistics would consist of remembering which formula to use. They never got to work with real problems or data, so he didn't realise that statistics is simply a tool to derive understanding and interpretation from data. 4. What was the course that started to build James' understanding? The Statistical Services Centre, University of Reading has an eLearning course called Statistics Made Simple or eSMS for short. The course is designed for people just starting research, either for a higher degree or for their work. It covers the key concepts of statistics that would be known if students had received a good course as undergraduates, and if they had been motivated to listen. Often statistics courses for non-statisticians have too many formulae and not enough explanation. It turned out that this course was an eye-opener for James and for other statistical colleagues. It was later provided for MSc statistics students in Kenya at the start of their MSc – James took it at the end! 5. In the video, Carlos mentioned the link to climatic. What's that all about? The current Instat+ is an ordinary statistics package, but with an extra menu for climatic analyses. This is designed to tempt National Meteorological Services (NMSs) to analyse their historical rainfall records (and other elements) more fully. All African countries have an NMS and most currently use Instat+ for their analyses. The staff are not particularly strong in statistics and the fact they use Instat+ easily gives us confidence that we have an appropriate “front-end" to the software. 6. Ok so you get the money the software exists. So what? This doesn't solve the problem! We believe that in the environments in which we work it will remove one of the major obstacles, which is a step towards a solution. We don't claim that this campaign will provide a solution to the statistical literacy problem. The stretch goals provide an indication of where we want to go. We do believe that, with the open educational resources that already exist, this software will enable lecturers to transform University level statistics teaching. One reason we are adamant about an open approach to our work is that substantial change often results from an incremental collaboration where others build from what we do and we, in turn, learn from them. This collaboration would be substantially enhanced if the software could cut across language divides. If we are going to impact statistical literacy it is essential to also work with the future generations, by bringing these ideas into schools. This is also work we are passionate about because of our experiences with maths camps! There are already amazing advances in software to help teaching statistical ideas to kids, most notably (Tinkerplots and Fathom), but implementation in Africa is problematic. Our final stretch goal challenges us to engage with the broader statistics education communities and explore innovations that could become scalable. 7. Is this it? What is next? This project is around one year's worth of work. The plan is to build a community which will make the software sustainable after this year. A natural follow on project is developing electronic textbooks and open educational resources for learning statistics. There are already good examples out there, such as CAST, for which an African version was created, that has been used successfully in Africa. This gives us foundations to build from. CAST, like Instat+, is in need of an overhaul. This is one element of "part two", alongside further development of open eLearning resources. 8. In the video, David said that you have been able to develop statistical understanding across all academic levels and disciplines. The challenge is to achieve sustainable, scalable change. Please elaborate a bit. there is value in working across academic levels and disciplines. This has particularly strong implications for doctoral level training in Africa, where we claim that less specialised PhD programs could have great impact. traditional approaches to scaling are problematic because it is difficult to achieve sustainable change. There is an opportunity for an alternative approach, through initiatives that "go viral". These observations have been instrumental in both the decision to try crowd sourcing and in our construction of the campaign where the stretch goals introduce multiple academic levels. 9. The site adds a fee for “chuffed" when I contribute. What is this about? Chuffed.org is a non-profit organisation and the only crowdfunding site that does not deduct a percentage from your contribution. To fund their operations they add a voluntary amount to your contribution. You can change this amount to zero if you wish. There are charges made by the third party payment provider (Stripe.com) which will remain in addition to your donation. Stripe.com have chosen to charge the same for credit, debit and American Express cards. If you do not have a credit/debit card, or do not wish to use your card, please contact us ([email protected]) for details on how to make an off-line contribution. 10. What's with the perks, they're weird? Where's my t-shirt? They do not affect the cost effectiveness of the project. They are designed to encourage a personal engagement with the project. The numbers limited to ensure interactions stimulate the work positively rather than becoming too distracting from core tasks. The most important to us is the first £1 perk which we hope will help build a visible community supporting the project. The "Learn some Stats" perk is a way for people to experience the resulting product first hand and understand why we feel this work is so important. We have a number of perks which provide opportunities for supporters to interact directly with the development team, either as testers or by coming to visit. Finally, where possible, we have broken down our budget so that it is possible to sponsor an individual component of the project. If you don't like our approach, or would still like to have a t-shirt, let us know in the comments! We value all your feedback. Got more questions? If there is something important you feel we haven't addressed, leave a comment. We'll do our best to get back to you as soon as possible. £1 <strong>or more </strong> Get yourself on our supporters map! We value the community we build over the money we raise and we will be excited to see our community grow both near and far. Please make any contribution and take the time to give us your location for our map. Cover the cost for a full day of work for one of our developers. Receive personal updates from your supported developer. Test the Beta version and help us improve before our first public release. You, or your nominated representative, gets to visit the team and work on something related to the project for up to a week. (Flights, insurance are not included but you will be offered local accommodation with our partners if you want.) We'll have a team in Tanzania and depending on scale Kenya or Ghana are also looking likely. Sponsor the contribution of an international expert who will work with the team for at least a week to support the development. Interaction with experts is an essential part of our model for the development of both the software and the development team. You will have the opportunity to discuss issues related to the project that you are interested in and receive the report of their interaction with the team. Our developers will be exceptional mathematical science masters graduates gaining experience before furthering their studies. This amount will be enough to fund one such person for a year. We believe that the optimism about Africa's future is justified because of people like them. Find out why for yourself by developing a personal relationship with one of Africa's promising bright minds. Come visit and they would be delighted to host you. * £22,891 in offline donations included in total.